Oriental Rug Spa offer a specialist Persian, Oriental and Contemporary rug cleaning in Grayshott. We also offer a rug repair service. If you own a dirty or soiled rug that needs professional cleaning, then why not give us a call on 01276 423150. You can drop the rug into our wash facility or arrange a time for us to collect from you. 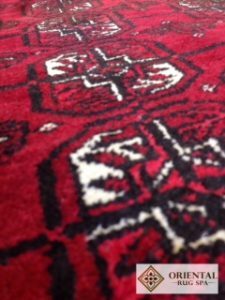 Afghan rugs are primarily woven in Afghanistan, however many are woven by Afghan refugees in Pakistan. They are distinctive pieces due to the shade of red used along with the coarsely woven wool pile. Many of the design elements are taken from Turkman tribal rugs - similar to that shown in the image on the left. As well as red dyes, many of these types of rugs can be constructed using dark to medium browns. Goat wool can be used to finish the sides of the rug which has a very coarse feel.